When shipbuilding in Portsmouth ceases next year it could signal an end to 500 years of the city's history. At its peak, more than 22,000 men and women worked at the dockyard. 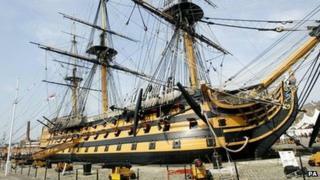 It has played a key role in producing Royal Navy ships that have seen battle on the seas throughout the centuries. King Alfred is thought to have instigated ship construction there as early as the 9th Century, but the first recorded warship, the Sweepstake, was built there in 1497 in what is thought by some to be the UK's first dry dock. One of its most famous ships was King Henry VIII's the Mary Rose, believed to have been named after his sister Mary Tudor. It was constructed between 1509 and 1511 but sank in 1545 while attacking a French invasion fleet. It was raised from the seabed in 1982 and now rests in a new museum in Portsmouth. Steven Gunn, lecturer in modern history at the University of Oxford, said the dockyard became increasingly vital to both Henry VII and Henry VIII as they sought to establish a more effective navy. He added: "They wanted a permanent body of royal ships which would require non-stop repair and dockyard factories, so the emergence of Portsmouth became important. "Previous kings had navies and then sold off the ships in peace time, but now there was a much larger number of permanent ships. "It was important as England's population was much lower than the big continental powers, and that continued right through to Elizabeth I and the defeat of the Spanish Armada in 1588." The dockyard continued to expand and develop so that by the middle of the 18th Century it had become one of the largest and most capable in the world. When the HMS Dreadnought was built there in the early 20th Century it marked the creation of the "modern" battleship, changing the nature of naval warfare. The yard was transformed by mass production techniques to build warships fit for a modern naval fighting force as the UK continued to invest heavily in its Navy. A symbol of when Britannia ruled the waves is still displayed at the city's dry dock - HMS Victory, from which Admiral Nelson commanded victory at the Battle of Trafalgar. It was built at another famous former Navy dockyard - Chatham, in Kent, which closed in 1984. Mr Gunn said the end of shipbuilding at Portsmouth could signify the UK's military priorities were changing. He said: "States have always thought it important to control their own production of military resistance. If Britain loses that control that says something of its aspirations to be a military power." Falling workloads led to BAE Systems announcing 18 months ago it was reviewing its shipyard, causing a shadow to loom over the city. Wednesday's announcement confirmed those worst fears with 900 jobs set to go. But it is not the first time shipbuilding has halted in the city. In 1967 construction stopped and - while repair work still continued - shipbuilding did not resume until 2003. Alex Hildred, curator of ordnance at the Mary Rose museum, said the ending of an era was a "shame" but the city's docks were always changing. She said: "It's an important place and one of the only historic ones that was still functioning, as Woolwich, Deptford, and Chatham are no longer going. "Now it's still making that important contribution to future generations in a way that people can visibly see." But Patrizia O'Mahoney, who lives in Portsmouth and worked at the docks as a teenager, said she mourned the end of shipbuilding in the city. She said: "I was immensely proud to be continuing a family tradition and also to be involved in some small way in protecting my country from alien forces. "This closure will cause loss of skills and will have a negative effect on the city. Our leaders simply cannot afford to cut back on our defences on land, sea or air. "In order to remain secure, we need to carefully reconsider how to refurbish and reinvent our military armoury to protect the unique integrity and special values of our nation's pride, security and culture. "Never mind the politics, keep us safe from harm, keep the skills, the tradition and strategic position of our nation's premier naval base alive, keep Portsmouth afloat."